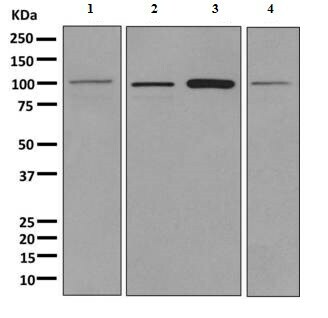 Synthetic peptide within Human SLC14A2 aa 500-600. The exact sequence is proprietary. K562, Human fetal kidney, 293T and TF1 lysates. Our Abpromise guarantee covers the use of ab156589 in the following tested applications. Specialized low-affinity vasopressin-regulated urea transporter. Mediates rapid transepithelial urea transport across the inner medullary collecting duct and plays a major role in the urinary concentrating mechanism. Isoform 1 and isoform 2 are expressed in the inner medulla of the kidney. Belongs to the urea transporter family. 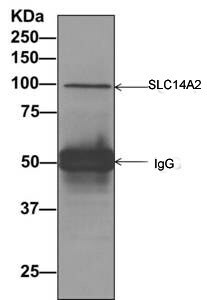 Detection of SLC14A2 by Western Blot of Immunprecipitate. 293T cell lysate pellet, immunoprecipitated using ab156589 at 1/10 dilution. ab156589 has not yet been referenced specifically in any publications. Publishing research using ab156589? Please let us know so that we can cite the reference in this datasheet. There are currently no Customer reviews or Questions for ab156589.